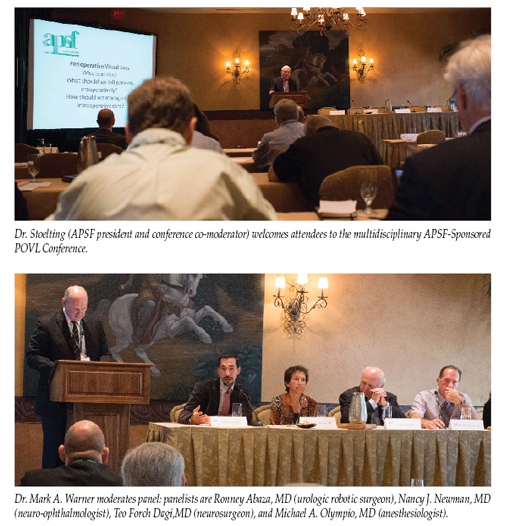 On September 12, 2012, the APSF sponsored a multidisciplinary conference, Perioperative Visual Loss: Who is at risk, What should we tell patients preoperatively, and How should we manage their intraoperative care? Assure that current management reflects evolving information and understanding of “best practices” for patients at risk for POVL. Create a “participant-developed, moderator-led statement of safety recommendations (“best practices”) for managing patients considered at risk for POVL. The anesthesia professionals included 13 attendees who had participated in the Postoperative Visual Loss Study Group (Anesthesiology 2012;116:15-24). Several of the other attendees participated in or represented organizations that supported the most recent American Society of Anesthesiologists Practice Advisory for Perioperative Visual Loss Associated with Spine Surgery (Anesthesiology 2012;116:274-285). The POVL conference included podium presentations, panel discussions, small group breakout sessions, and completion near the end of the conference (following all podiums presentations and panel discussions) of a questionnaire/survey. For the initial organizational purposes of the conference, POVL was assumed to be due to ischemic optic neuropathy (ION) or central retinal artery occlusion (CRAO). High-risk patients for ION were defined as those undergoing spine procedures while positioned prone and who had prolonged procedures (exceeding an average of 6.5 hours) and experienced substantial blood loss (an average of 44.7% of the estimated blood volume), or both (Anesthesiology 2012;116:274-282). A similar definition with regard to operative duration was arbitrarily applied by the APSF to head-down (degree of head-down not definable) robotic/laparoscopic surgeries. An overwhelming theme of the conference presentations, panel discussions, and small group breakout sessions as well as the questionnaire/survey was the importance of including the risk of POVL caused by ION in the informed consent process. For patients considered to be at risk of POVL caused by ION, anesthesia professionals and surgeons should include discussion of the remote risk of visual impairment, ranging from partial vision loss to complete blindness in both eyes, during the informed consent process. POVL from CRAO caused by external globe compression was felt by the attendees to be largely preventable with the use of appropriate positioning aids and monitoring of the external globes (eye checks) during the intraoperative period. Discussion of the rare adverse event of CRAO during the informed consent process should be left to the discretion of the anesthesia professional and surgeon. The current state of understanding as to risk factors for POVL due to ION. The interventions that may reduce the risk of POVL due to ION. Indeed, the value of the informed consent process to the patient is dependent on those responsible for the perioperative care to be cognizant of evolving information and strategies designed to reduce the risk of POVL caused by ION. It was recognized that POVL is a rare event that, based on its incidence (less that 0.2% of spine surgeries), might not be considered for inclusion in an informed consent by anesthesia professionals and surgeons. However, the rare occurrence of POVL caused by ION is negated by the “extreme value that patients place on vision”) as demonstrated by patients’ willingness (>80% surveyed) to accept risks of stroke or death to save some vestige of vision (Ophthalmology 1996;103:691-696). When patients who had undergone prior spine surgery were asked if they would want to be consented for the risk of POVL with prone spine surgery, more than 80% reported that they would prefer full disclosure of the risk of POVL by the surgeon in a face-to-face discussion prior to the day of surgery (Mayo Clinic Proc 2011;86:865-868). A total of 67 questionnaire/surveys out of a possible 74 were returned by attendees at the conference who designated their affiliation as “anesthesia professionals.” Their responses to the survey questions are discussed below. The questionnaire/surveys available from the other professional affiliations were considered too few (n-12) to analyze but were recognized to be supportive of the consensus of the anesthesia professionals with respect to the need for inclusion of the risk of POVL during the informed consent process. Of anesthesia professionals, 23.9% (16 of 27) had cared for one or more patients who had experienced ION, whereas another 46.8% (30 of 67) were aware of this complication occurring in their hospital/practice group. CRAO was infrequent with 95.5% (64 of 67) of the anesthesia professionals indicating they had not cared for a patient who experienced blindness due to this mechanism, and only 22.3% (15 of 67) were aware of this complication occurring in their hospital/practice group. Thus, for the purposes of this report, POVL will be considered to be due to ION in the subsequent sections. The vast majority of anesthesia professionals, (86.6%) responding to the questionnaire felt that “most surgeons do not recognize the risk of ION in the susceptible patient population, whereas 52.2% felt the same was true for anesthesia professionals. Of respondents, 85.9% felt that “risk factors for ION” could be modified or eliminated by both the anesthesia professional and surgeon. Of anesthesia professionals, 85.1% agreed that best practices management guidelines to decrease the risk of ION should be based on steps to decrease the likelihood of venous congestion and edema formation in the periorbital area/head. There was agreement among 63 of 67 anesthesia professionals that male gender, obesity, decreased percent colloid administration of nonblood replacement, and use of the Wilson frame should be added to the risk factors for developing ION following spine surgery. A need to balance colloid and crystalloid administration was supported by 58 of 67 attendees (86.6%). Most anesthesia professionals (97%) agreed that “during spine surgery, the patient’s head should be positioned level with or higher than the heart” in patients considered to be at risk for ION. Although controlled hypotension has not been identified as an independent risk factor for ION, 57 of 67 anesthesia professionals (85.1%) agreed that “controlled hypotension should not be used routinely in patients considered to be at risk for ION.” There was agreement among 55 of 67 anesthesia professionals (82.1%) that “consideration should be given to the use of staged spine procedures” when the duration of spine surgery is anticipated to be prolonged (preoperatively) or becomes prolonged (intraoperatively). The need to periodically monitor hemoglobin or hematocrit to detect anemia in patients considered to be at risk for ION was supported by 60 of 67 anesthesia professionals (92.3%), while 86.6% agreed that a specific “transfusion threshold that would reduce the risk of ION related to anemia was not known.” Further, 89.6% of the anesthesia professionals agreed there is no proven treatment for ION when it manifests postoperatively. During the informed consent process, anesthesia professionals and surgeons should include discussion of the remote risk of visual impairment ranging from partial vision loss to complete blindness in both eyes for patients considered to be at risk for POVL from ION. If the risk of POVL from ION is not part of a combined anesthetic and surgical informed consent process, or part of a separate surgical informed consent process, it should be part of the anesthetic informed consent process. The informed consent process may include a discussion of risk factors (prolonged spine surgery in the prone position or prolonged robotic surgery in the head down position, increased blood loss, male gender, obesity, use of Wilson surgical frame) and the current understanding of interventions that may reduce the likelihood of POVL caused by ION (minimize duration of surgery, consider staged spine procedures, keep head at or above the level of the heart, minimize use of surgical frames that place the head lower than the heart, include colloid in nonblood replacement). Discussion may include the concept that this complication is difficult to study because of its low incidence. Preventive measures are based on the our best educated guess from what we know of the risk factors but have not been tested. Use of controlled hypotension in patients at risk for POVL caused by ION, although not documented to be an independent risk factor, is not recommended on a routine basis. POVL from CRAO caused by globe compression should be preventable with the use of appropriate positioning aids and monitoring of the external globes (eye checks) during the intraoperative period. Lorri A. Lee, MD Conference Co-Moderator amd Co-Editor, APSF Newsletter Professor, Department of Anesthesiology and Pain Medicine, University of Washington. Practice advisory for perioperative visual loss associated with spine surgery: An updated report by the American Society of Anesthesiologists Task Force on Perioperative Visual Loss. Anesthesiology 2012;116:274-285. Risk factors associated with ischemic optic neuropathy and spinal fusion surgery. The Postoperative Visual Loss Study Group. Anesthesiology 2012;116:15-24. Margo CE, Mack WP. Therapeutic decisions involving disparate clinical outcomes: Patients preference survey for treatment of central retinal artery occlusion. Ophthalmology 1996;103:691-696. Corda DM, Dexter F, Pasternak JJ et al. Patients’ perspective on full disclosure and informed consent regarding postoperative visual loss associated with spinal surgery in the prone position. Mayo Clinic Proc 2011;86:865-868.